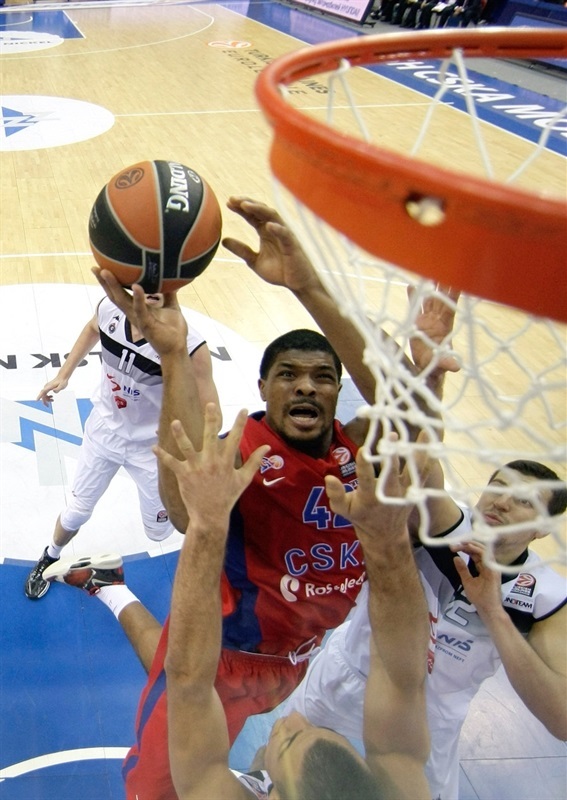 CSKA Moscow got back to its winning ways by crushing a depleted Partizan NIS Belgrade 88-46 on Friday. 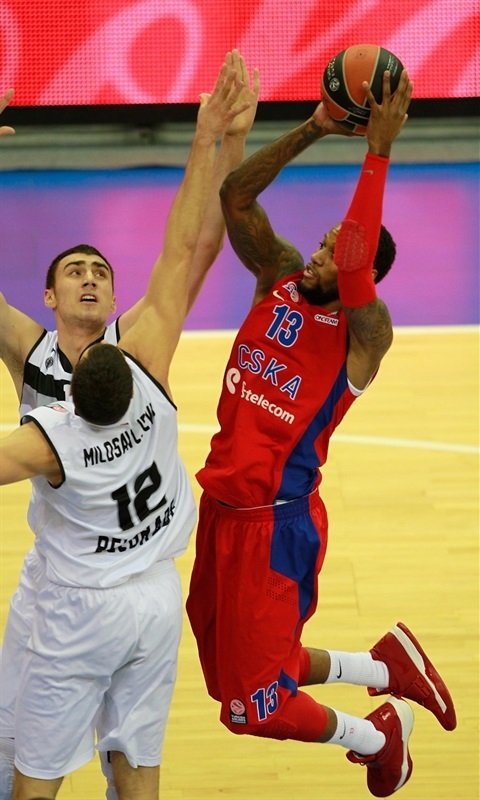 The win improved CSKA to 3-2 for a share of the second place in Group A, while Partizan dropped to 1-4 and fifth place. CSKA took control from the beginning and with its aggressive defense that forced 23 turnovers, built a big margin throughout the game. The hosts were up 32-12 midway through the second quarter, held 42-18 at halftime, and in the fourth quarter had as much as an 88-42 advantage. 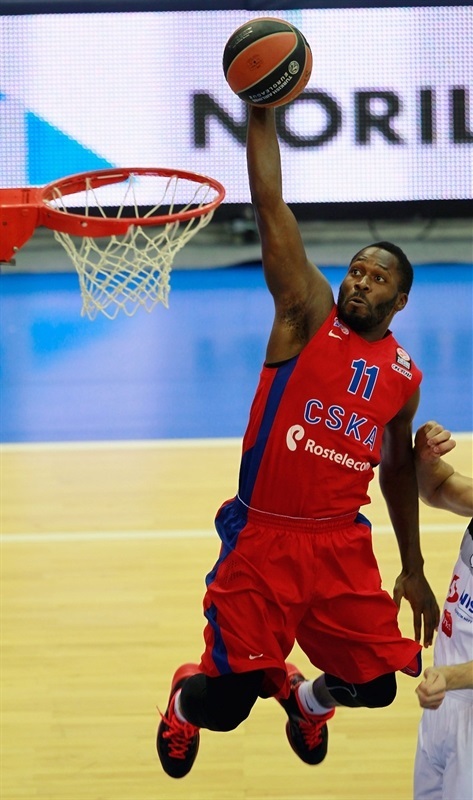 Sonny Weems paced CSKA with 18 points and 8 assists, Vitaly Fridzon netted 16, and Vladimir Micov 15 points in victory. Partizan was without Tarence Kinsey, Dejan Musli and saw Leo Westermann go down with knee injury early in the game. Bogdan Bogdanovic led the visitors with 13 points, while Joffrey Lauvergne had 9 points plus 12 rebounds. 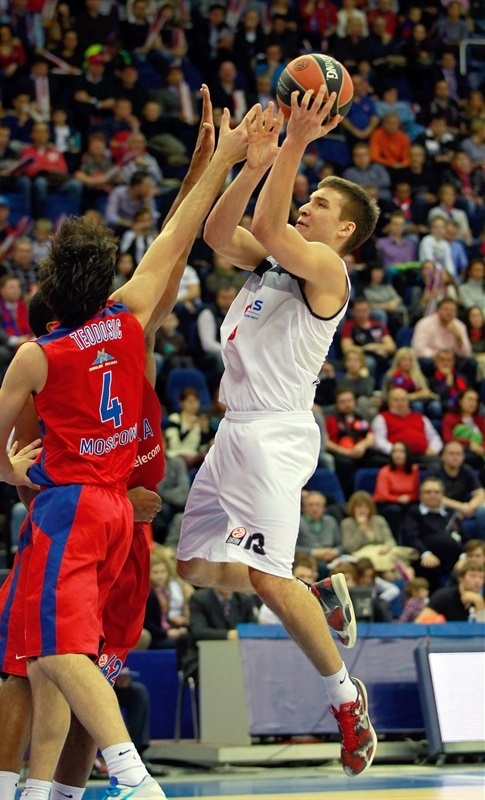 CSKA took control from the start, despite Leo Westerman opening scoring with a floater. Micov quickly put CSKA on the scoreboard with a baseline jumper, before Jeremy Pargo made a fastbreak dunk, and Weems scored a layup for a 6-2 advantage. After Lauvergne banked in a shot, Victor Khryapa replied with a two-handed reverse fastbreak dunk, and Micov added a hook shot. After a timeout, Partizan tried with 1-3-1 zone defense, but Khryapa sank a three-pointer. Westermann hit a long jump shot and Bogdanovic made a baseline jumper, but CSKA's defense did not allow the visitors much more than that. Sasha Kaun had an easy dunk and a put-back for 19-10, before Pargo's reverse layup extended the margin to double digits. 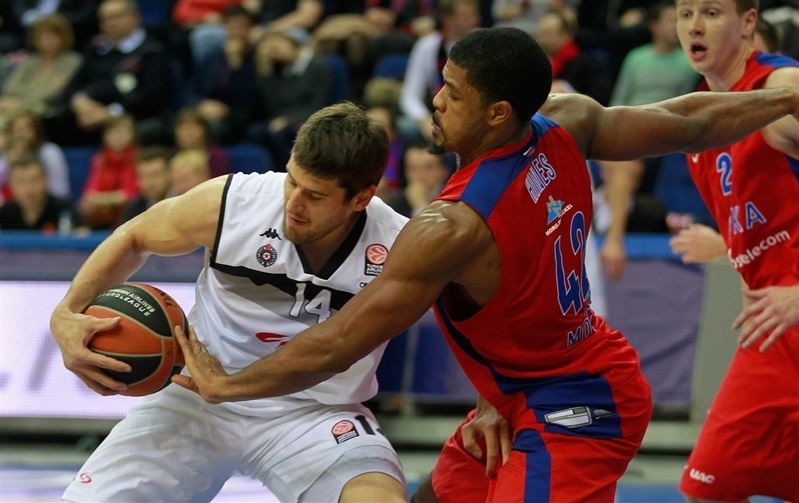 Partizan was in more trouble when Westerman was forced to leave the game with knee injury. CSKA held 21-10 after 10 minutes. The start of the second quarter was similar to the first, with CSKA's defense allowing only one field goal in the first five minutes of the quarter. Kyle Hines started things with a dunk, and after a layup from Bogdanovic, Hines and Weems made layups before Vitaly Fridzon sank a triple and a mid-range jumper for 32-12 advantage midway through the second quarter. After a timeout, Nikola Milutinov ended a long Partizan drought with a basket-plus-foul, but layups from Kaun and Weems extended the lead to 37-15. Milosavljevic made a runner, but CSKA's offense was rolling as Weems answered with basket-plus-foul, and Khryapa made a baseline jumper for a 42-18 halftime lead. Nemanja Bezbradica and Micov traded triples to start the second half, but it was all CSKA after that. Weems and Micov fueled another big run, as Weems hit a jumper, Micov sunk another three-pointer, and Weems made a big fastbreak dunk. A jumper from Khryapa opened a 55-21 margin, as the visitors were without a single point for more than 5 minutes before Milosavljevic snapped a 13-0 run with a tough three-pointer. Bogdanovic also hit from behind the arc to help cut it to 59-29, but Hines scored inside, and Fridzon's back-to-back triples helped CSKA to a 69-31 lead after three quarters. Micov opened the fourth quarter with a triple, as CSKA kept its intensity and hustled on defense to increase the margin to 74-31. Lauvergne and Milutinov scored layups for the visitors, before Aaron Jackson and Bogdanovic traded triples. However, the margin reached 46 points after Weems hit a three-pointer, Jackson made 4 free throws, and Andrey Vorontsevich made a long jumper, 88-42. Near the end, Dallo made a couple of put-backs to round out the scoring. "We have to remember that Partizan’s game was affected by the absence of several injured players. Still I think we did everything in a right way, we played great defense, protected the paint and put the pressure on their shooters. On the other side we moved the ball well and quickly and that positively influenced our shooting percentage. It was very important that we had a lot of fans in the stands – that helped us a lot. We will continue to work hard and hopefully to win." "Congratulations to CSKA for this well-deserved triumph, which is expressed by the final margin. The opponents played with great focus throughout 40 minutes. It is a fact that we had three players injured: Musli stayed in Belgrade, Kinsey could not play because of back spasms and Westermann landed unfortunately and injured his knee, which will be evaluated later. That shortened our rotation, but overall it cannot be taken as an excuse for our bleak game. It should be mentioned that CSKA was highly motivated after two losses and I warned my players about that before the game. Taking into account the age of the players and injuries, we had no high expectations. The outcome is still very painful for me, but we have to look forward and prepare for the next game. " 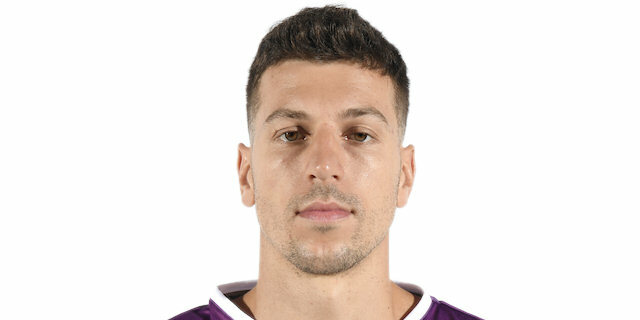 "We had really hard practices because we understood that the game is highly important for the team, especially after two losses to Fenerbahce and Barcelona. Also we had five days for preparing, during which we tried to do our best. Coach just dotted all the “i”s. 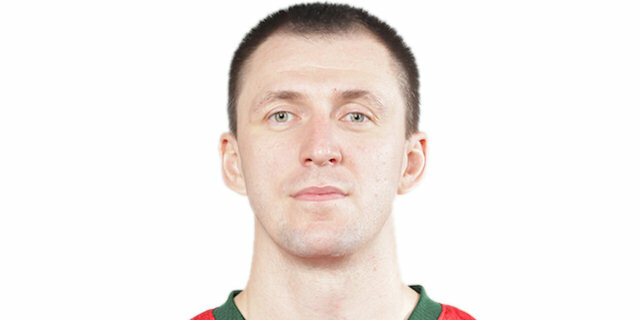 Everybody in CSKA knows his role. Next game we’ll try to be more responsible. It is very important to qualify for the Top 16. We wanted to feel the taste of the win again. We played hard as crazy trying to get that." "We didn’t play a good game today. It went the wrong way, we played bad on defense and let them score a lot of easy points. Unfortunately, we had no concentration; also one more important player got injured. 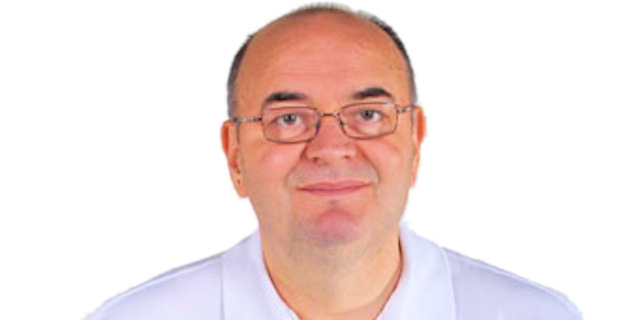 But there are a lot of games in the Euroleague season, we just must improve our skills. "